11 year old Jeaden had one wish — to have a birthday party with lots of people. Because he struggles socially, with mild autism and sensory processing, his birthdays have sometimes been a disappointment with only family members showing up. 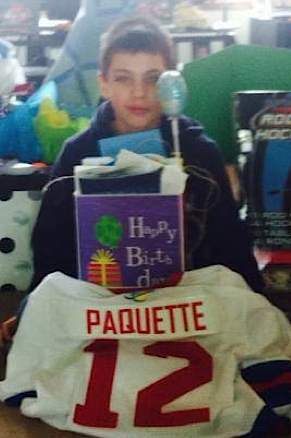 For his twelfth birthday his mom was determined to give him a childhood party to remember. With the help of local media, who spread the word, businesses that donated, and a Facebook page she set up, the gathering, held at a local roller rink in Prince George, B.C., was a huge success. The town rallied. The boy’s mom, Jolene, said about 200 people showed up. A bakery made a huge cake and Walmart donated drinks. The PG Rollergirls decorated the rink, and a girl’s softball club stayed to clean up. Hasbro toys heard that the boy loved Nerf battles and asked if they could send 9 huge Nerf guns. The giant Nerf battle that resulted was Jeaden’s favorite part of Saturday’s soiree. The soft and foamy ammo flew all around, while participants dodged behind barricades set up across the roller derby floor. People who heard about the story but couldn’t attend sent cards — some all the way from the Czech Republic. He was sent a local team jersey, and an autographed picture of a Canucks hockey star.